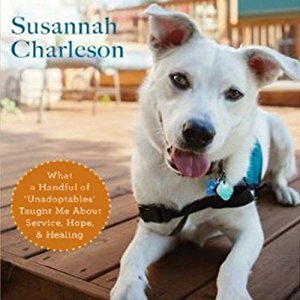 Charleston recounts a little of that stress, but focuses mainly on her discovery of "psych dogs" and their work, and her own growing interest in training rescue dogs as service dogs. She had a plan to search for a dog in need of rescue whom she could train for service dog work, though she knew that could be a heartbreaking task. Along the way, she also had a friend dying of cancer, who asked her to take in her two Pomeranians. One of those dogs had crippled hind legs, but a sweet and sunny disposition. The other was so focused on his owner, and devoted to her, he had real difficulty being separated from his owner when the time came. Both of these dogs proved to have untapped potential. The puppy needed extensive vet care, but survived, and became the first dog she seriously tried to train as a service dog. 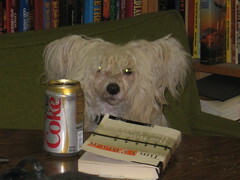 Training Jack became a key part of how she worked on her own difficulties with OCD. We meet some fascinating people in her story, people who regained independence and confidence through working with the right service dog. We also meet some amazing dogs. It's a moving story and a great listen.